Between the Alps and the Po Valley, about 65 m above sea level, the lake is located in the north in the Trentino-Alto Adige in the west in Lombardy, Veneto in the east. Thus, the three provinces of Trentino share (north), Verona (east) and Brescia (west) administration. 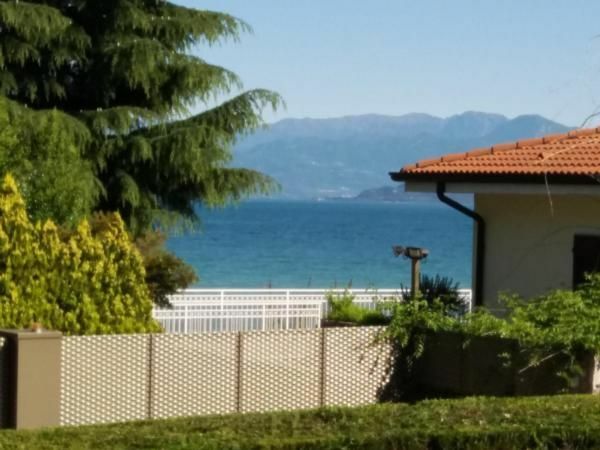 The apartment (approx 60 m²) is located close to the beach (only 20 meters) and is located in a quiet resort - a total of only 4 apartments units - right on the lake with private dock, not far from Gardaland amusement. It consists of a living room with sofa bed and satellite TV, a kitchen, a double bedroom and a bathroom with shower and toilet. Washing machine and dishwasher. The object is further adapted with great care. The kitchen has all appliances: microwave, toaster, coffee machine, kettle, also cutlery, glasses, plates, cups, etc. Outside there is a patio, a private garden and a lockable parking space. The property is fenced. The stay in this apartment is ideal for families especially recommended. The nearest shops are located about 3 km, the nearest restaurant 600m. The apartment is further decorated with great care - see under "TOTAL EQUIPMENT" - and is just a few minutes walk from the center PACENGO away. There you will find a supermarket, bakery, bank, post office, hair salon, and numerous restaurant establishments. There is also a home delivery service for pizzas. In the vicinity there are many shopping and great outlet center, where there are brand merchandise at bargain prices. The atmosphere is inviting, because transactions are created in the Outlet Center as in a small shopping street and not in an enclosed mall. This apartment is located in close proximity to the famous Gardaland, Caneva Aquapark and Movieland, and the Thermal Park Cola. The surrounding cities: Lazise, Garda, Bardolino, Peschiera, Sirmione, Valeggio + Verona offer natural beauty and interesting monuments. The kitchen has all appliances: microwave, toaster, coffee maker, kettle, also cutlery, glasses, plates, cups, etc. Well behaved pets welcome (please specify size). SEA BEACH (stone beach): about 30 meters. DOG BEACH: approx. 5.0 Km from our apartment was opened in 2011 a beach on Lake Garda for dogs. This may even our 4-legged friends to swim. THERMAL PARK Cola in LAZISE 0.8 Km. AQUA PARK "CANEVA" in Lazise 3 Km. Affi / Garda south on the A22: about 8 Km. General: per object and day Costs amounting to 30 EUR (Mandatory). Cot for children: per object and week for rent at a price of 10 EUR (optional). Towels: per object and week for rent at a price of 10 EUR (optional). Bed linen: per object and week for rent at a price of 10 EUR (optional). Bed linen (once per person, vorhanden 10 EUR). Cot (Per property and week, to be brought by the traveller 10 EUR). Pet (per property and day, included in price 10 EUR). Towels (once per person, vorhanden 10 EUR).